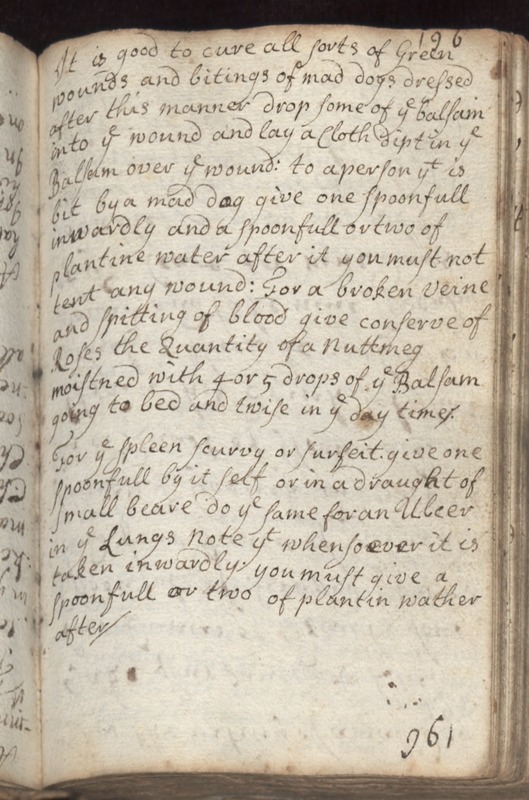 It is good to cure all sorts of Green wounds and bitings of mad dogs dressed after this manner drop some of ye balsam into ye wound and lay a Cloth dipt in ye Balsam over ye wound: to aperson yt is bit by a mad dog give one spoonfull inwardly and a spoonfull or two of plantine water after it you must not tent any wound: For a broken Veine and spitting of blood give conserve of Roses the Quantity of a nuttmeg moistened with 4 or 5 drops of ye Balsam going to bed and twise in ye day time. For ye Spleen Scurvy or Surfeit give one spoonfull by it self or in a draught of small beare do ye same for an Ulcer in ye Lungs note yt whensoever it is taken inwardly. you must give a spoonfull or two of plantin wather after.